Amino acids are metabolized variably by gram negative aerobic and facultatively anaerobic bacteria as well as gram positive cocci. These amino acids are decarboxylated, hydrolysed or deaminated depending on the organism and the amino acid in question. In decarboxylation, the enzymes break the bond holding the carboxylic (-COOH) group to the rest of the amino acid. There are three decarboxylase enzymes that is routinely tested for – arginine decarboxylase, ornithine decarboxylase, and lysine decarboxylase. The production of lysine, arginine, ornithine decarboxylase by various members of Enterobacteriaceae offers an important parameter to other biochemical tests for differentiating bacteria within closely related groups. To differentiate decarboxylase producing Enterobacteriaceae from other gram negative rods. Decarboxylases are a group of substrate specific enzymes that are capable of reacting with the carboxyl (COOH) portion of amino acids, forming alkaline-reacting amines and byproduct carbon dioxide. Some microorganisms possess such an enzyme which allows their detection. The test thus measures the enzymatic ability (decarboxylase) of an organism to decarboxylate (or hydrolyze) an amino acid to form an amine. Decarboxylation, or hydrolysis, of the amino acid results in an alkaline pH. The increased pH of the medium is detected by color change of the pH indicators bromcresol purple and cresol red present which results in a color change from orange to purple. Peptic digest of animal tissue (5 g), beef extract (5 g), bromcresol purple (0.1 g), cresol red (0.005 g), dextrose (0.5 g), pyridoxal (0.005 g), amino acid (10 g), pH 6.0. Prepare a suspension (≥McFarland No. 5 turbidity standard) in brain-heart infusion broth from an overnight culture (18 to 24 hours old) growing on 5% sheep blood agar. Inoculate each of the three decarboxylase broths (arginine, lysine, and ornithine) and the control broth (no amino acid) with 4 drops of broth. Add a 4-mm layer of sterile mineral oil to each tube. Incubate the cultures at 35°-37°C in ambient air. Examine the tubes at 24, 48, 72, and 96 hours. Inoculate tubes with 1 drop of an 18- to 24-hour brain-heart infusion broth culture. Incubate the cultures for 4 days at 35°-37°C in ambient air. 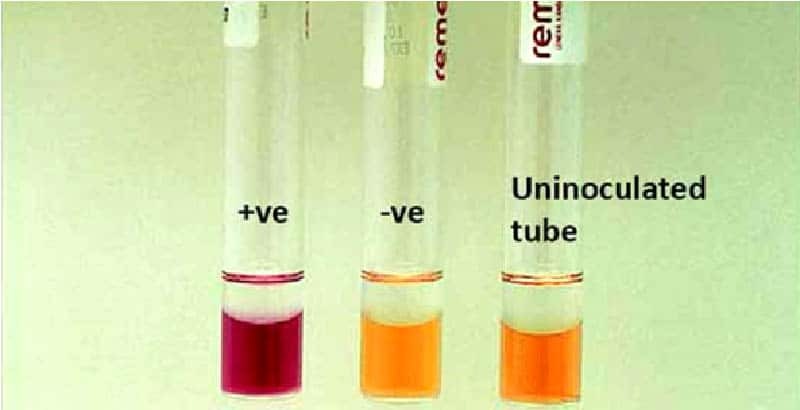 Negative: No color change or acid (yellow) color in test and control tube. Growth in the control tube. Arginine decarboxylase test aids in differentiating enteric bacteria with closely related physiological characteristics. Lysine decarboxylase test assist in the identification of Salmonellae (+ve) and Shigellae (-ve). The test does not measure the amount of intracellular enzyme and detect it only when it is sufficient to cause a pH change in the medium. Changing the growth conditions (i.e., the concentrations of glucose, lysine, and amino acids other than lysine) may greatly influence the lysine decarboxylase activity in coliforms. The fermentation of dextrose in the medium causes the acid color change. However, it would not mask the alkaline color change brought about by a positive decarboxylation reaction.